Thinking of having an artificial grass lawn but instead of trying to calculate the area, shoving it into the back of your car and having to do several trips. Then you have the problem of laying it. What direction do I lay it? Do I pin it? Glue it? How do I join it? The added pressure of not wanting to muck it up because it´s quite expensive, and despite what the salesman says, do I even have a good product? What is the main incentive for this? Probably because you think you can do it cheaper than employing a professional company. If I told you that you could have a professional team come in, show you a wide variety of quality artificial grass that looks amazing, calculate what you require, deliver, prepare and lay the grass as you imagined and for only a few euros a meter squared more than you can do it yourself with a better quality grass, you may think I was pulling your leg. Well, I am not. It’s the sad truth that on too many occasions we are called to help people who have had either a builder, someone they know or themselves lay artificial grass and unfortunately its all gone a bit wrong for lots of reasons. As with any trade, there are tricks to them and we know our trade. Any professional company makes a hard job look easy, and that is the case with Charlesworth Gardens and its sister company Artificial Grass Spain. 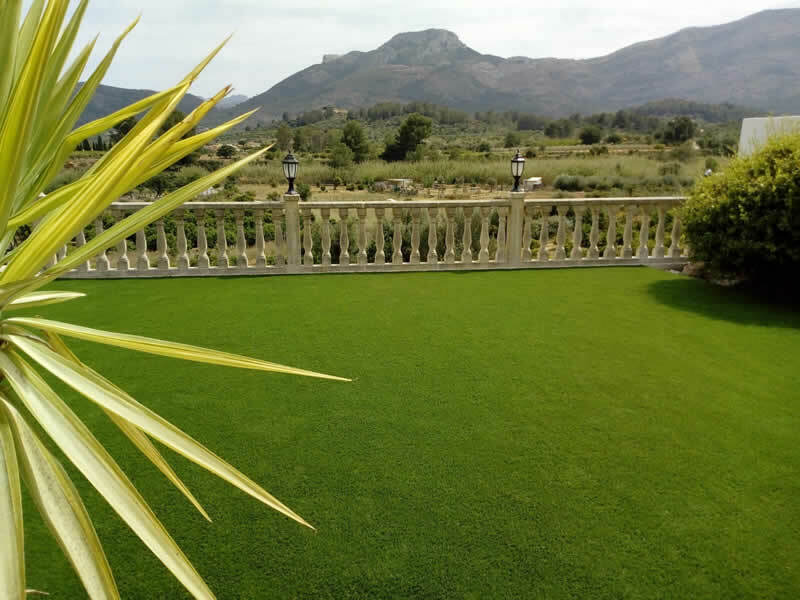 We have laid countless artificial grass jobs throughout the Costa Blanca for over 12 years, we were there in the beginning and have seen and even helped develop artificial grass. Because of our garden design and landscaping background we have created innovative solutions to lay our grass in ways many other companies still do not. The fact is that laying artificial grass is difficult and to do it properly can be very difficult and it is only our experience and knowledge that helps us make it look easy, and this is why so many other contractors struggle to provide a product and finish the way it should be. All our Spanish made grass is made to ISO and EU regulations not just for the product, but for the work place that manufactures the grass as well. Even though the differences are subtle between our grass and other more economical grasses available, there is a difference and these small differences are the things that make our product strong and effective and therefore has a lot more resistance to use and will look good for years. We have had to give professional statements for customers against other large suppliers for sub-par product and have had to rescue to many customers, which costs them even more money. So, get it right the first time around and contact a professional company that cares as much about you garden and the way it looks as you do.